Cynthia's career has led her around the world, initially specializing in orchestral pop from Big Band Jazz to Broadway, and then crossing over into producing records for young and seasoned artists in the rock, country, and folk-rock world. She credits her successes to having had “old school/boot camp” studio training in the tradition of and under the tutelage of Phil Ramone and engineers within that lineage at A and R Recording. In 2002 she won a Grammy Award for recording and mixing "The Producers". In 2007 she won an Emmy for composition and music supervision on the longest running daytime series "Guiding Light". And in 2011 she garnered another Grammy for her work on the "Julie Andrews Collection" CD. Over the last two decades, Cynthia has recorded and mixed and/or produced hundreds of large-scale productions in New York City such Barbara Cook at the Metropolitan Opera House, Lincoln Center and Carnegie Hall, the majority of the City Center's Encore Series' CDs, and over 100 Broadway and Off-Broadway shows. Her work has taken her to Abbey Road where she recorded the London Symphony Orchestra with Chaka Khan on her Classikhan CD and concerts at Sadler's Wells Theatre. For years she also mixed live sound for the American Symphony Orchestra and Concordia Orchestra at Alice Tully Hall and Avery Fisher Hall. Cynthia works extensively in television and film contributing to thousands of projects and working with many renowned actors such as Julianne Moore, Alec Baldwin, Naomi Watts, Scarlett Johanssen, Liev Schreiber, Chris Bauer and Sarah Jessica Parker. 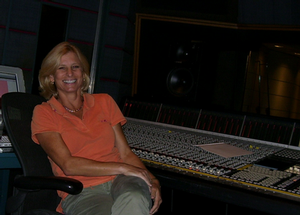 She's recorded and mixed major themes for television including World News Tonight, 20/20 and a remix of ABC's Wide World of Sports, and supervised/mixed the post-production for countless feature film promos for VH-1 and MTV. In August 2011, Cynthia opened the East End's first world-class recording studio designed by renowned architect John Storyk. Here, she produces and mixes every genre of music from Hip-Hop to Punk Rock and straight ahead rock ‘n roll with artists such as Chad Smith (Chili Peppers) and electronic music with rising star DJ Aiden Jude. This past August she booked time with Beyonce, Coldplay and Nile Rogers, all of whom have recorded at her studio since its inception. Such repeat business speaks to the highest standard of technical, aesthetic and service-oriented excellence. Cynthia still splits her time between East Hampton, where she owns, and serves as chief engineer at, MonkMusic Studios, and Manhattan, where orchestras come together for live large-studio work in Broadway and film.